The following are all the cards that have been made of me from first to latest. 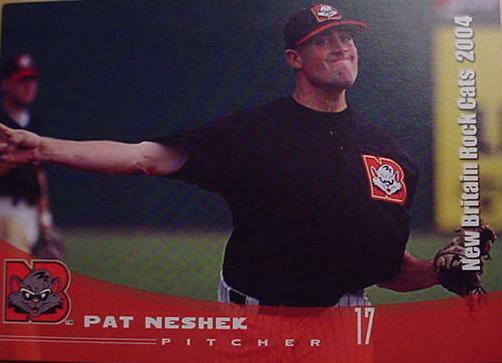 This card was made about 2 weeks into the season before a game, notice the long sleeves. It was probably 40 degrees out if that. The photographer asked each pitcher to go off the bullpen mounds and throw to another player. This seemed liked a boring card to me so I asked if I could do another pose for my shot. He said ok but to still throw some off the mound for backup shots. I ran into the training room and grabbed a sharpie and took it out to the photographer. I told him to get a shot of me fake signing a ball while I looked into the stands. It seemed to have worked but I wish he would've got me smiling instead of getting me in the middle of my eyes blinking. 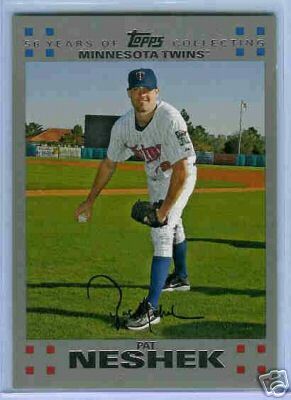 This is the card that was suppose to be my Quad City card if I didn't ask to get a shot of me signing a ball. Pretty boring history behind the card. 40 degree temperatures, bullpen mound in QC and me fake throwing to another teammate. 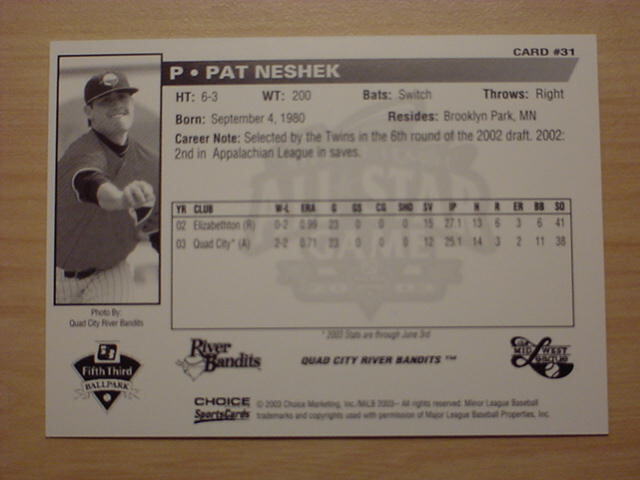 Well just found out today (4/13/04) that this card exist! 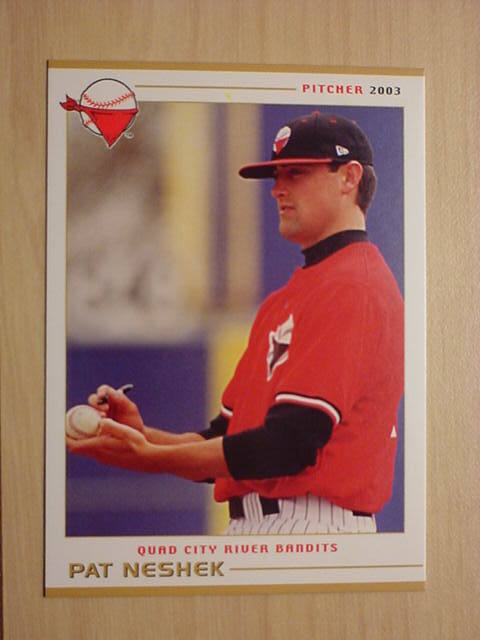 I'm not sure when the card came out, I'm pretty sure this was right after my first season in E-Town. My name is there, I guess I can consider it one of my cards!!! 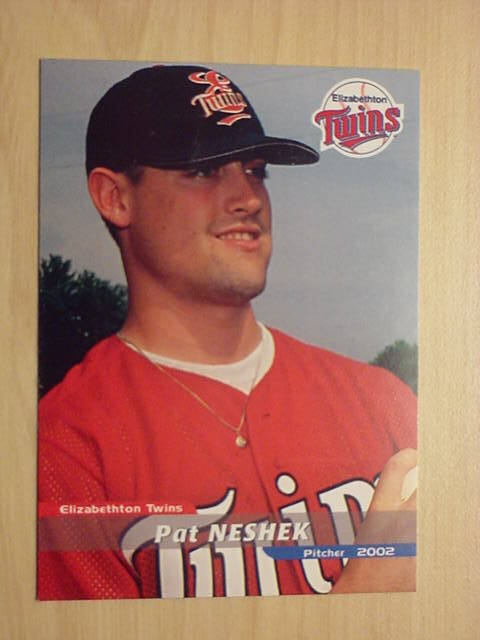 The other main indicator of the 2003 season is that Josh Renick is in the background, he was released by the Twins in the offseason. 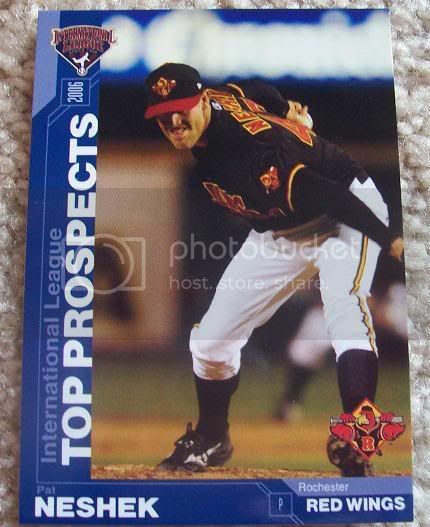 George Petro took the shot and I found out from him it was taken August 17th 2003 & if I am correct it was my only career start & it was against the Portland Sea Dogs. It was George's third game as a Rock Cat photographer and he took a great shot. 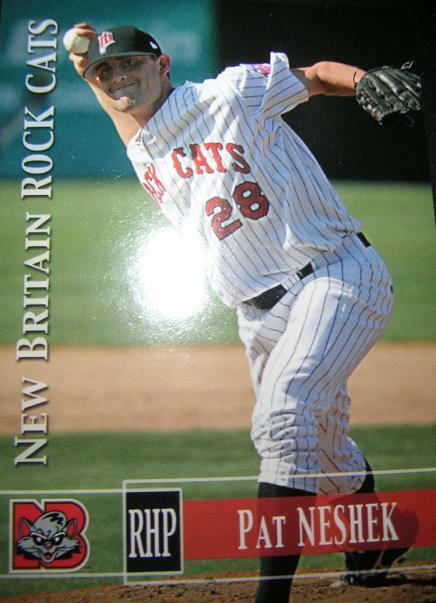 He also noted that the Rock Cats cropped out the ball on the card which would've made it a lot cooler looking. 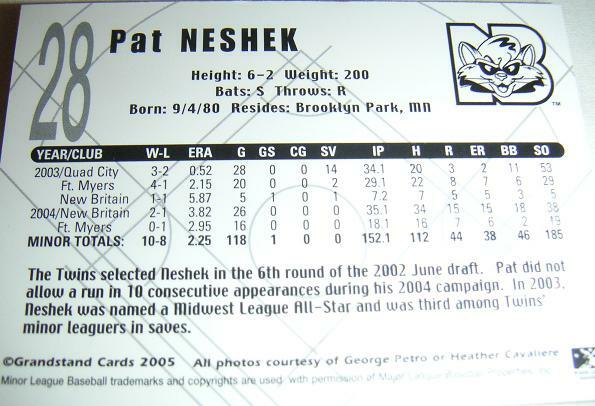 2003 I only pitched 7 innings for the Cats as I was called up in late August. Overall I think it's a great card because you can see my arm angle and a lot of veins popping out. I also am making a weird face so I guess that's what my game face looks like. This shot was taken at home on April 16th 2005 versus the Harrisburg Senators. It was also a warm up pitch right before the inning started by George Petro. A couple cool things about the card. One you might notice the grip I have on the baseball. It's a two seam grip that I use to throw submarine style...Not my normal sidearm, I'm talking Dan Quisenberry Style. Since spring training I have pretty much stopped using this pitch and have only used it in warmups. So it's pretty rare to see me using that grip and also tells me that this picture was a warmup shot. 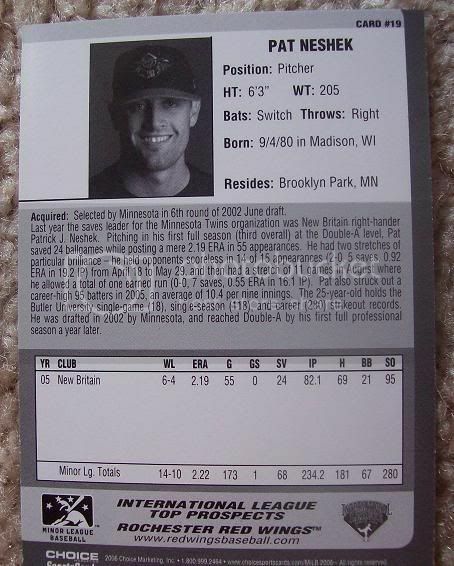 Also the card does contain a couple errors. On the back it shows me as having no saves last year which is not right. I had 10 saves with Ft. Myers and 2 with New Britain! Overall I really like the card. It's a nice clean shot of me pitching and the infield dirt provides an awesome area to sign my signature on unlike last years card. If you see one of these you might want to throw it up on eBay, the same sorry sap might pay $390 like he did for the 1st one he bought??? 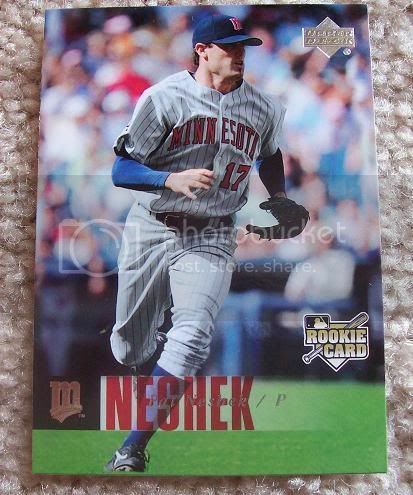 2006 Topps 1952 Edition "The Rookies"
Everything is the same as the regular Topps series one except this was issued in Hobby Sets only and has a different number on the back. I really don't know the history on this card. 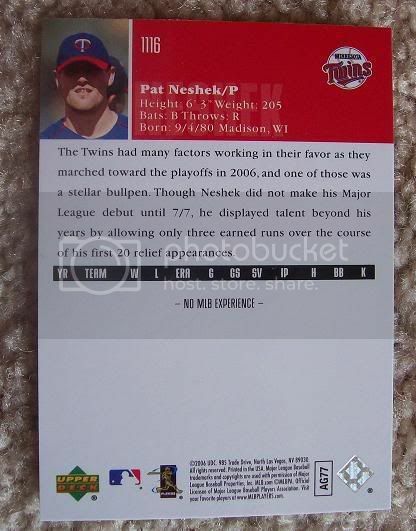 It is the same card as my 2007 Series 2 UD card but has script on the front of the card that says "Predictor Edition". 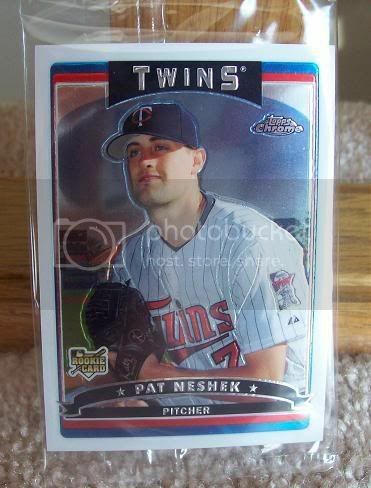 The Twins batboy Adam found this card for me online and I thought it was an error card...haven't seen another like it. Basically the same card as my series one card except it comes in a factory set box with all the other cards in the set. Same # and same image...nothing different. 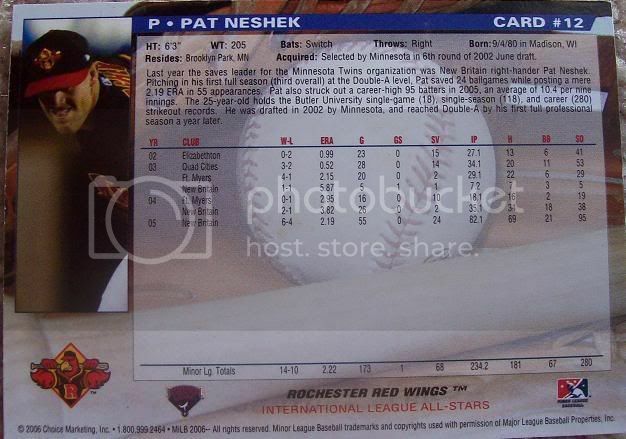 Once again the same image as my 07 topps card but this time it has a different # on the back...#28. 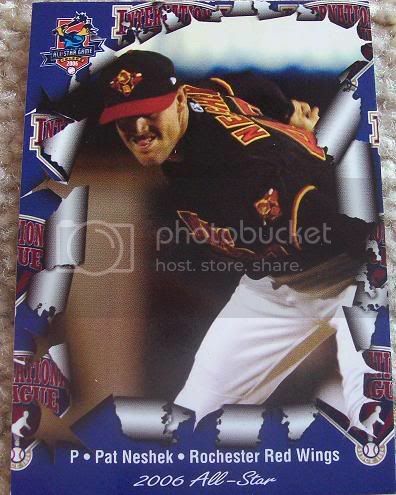 You can only get this card by buying the 2007 holiday edition factory set. There was a lot of sad fans when they found out I wasn't included in series one! 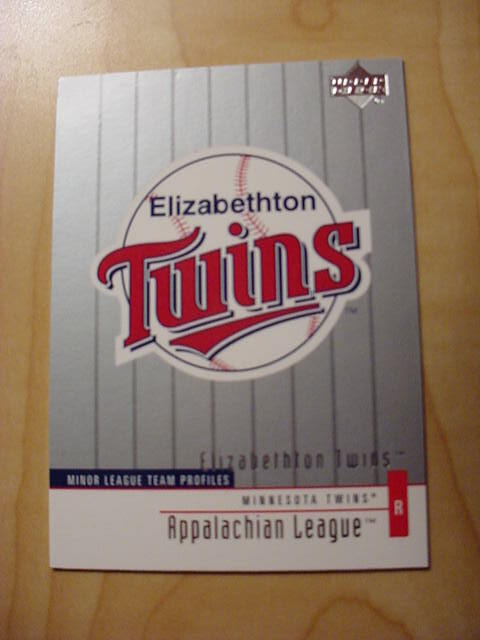 This is my first card of 2008. I'm not sure what stadium is in the picture or the date...pretty random image of me getting ready to throw a pitch. 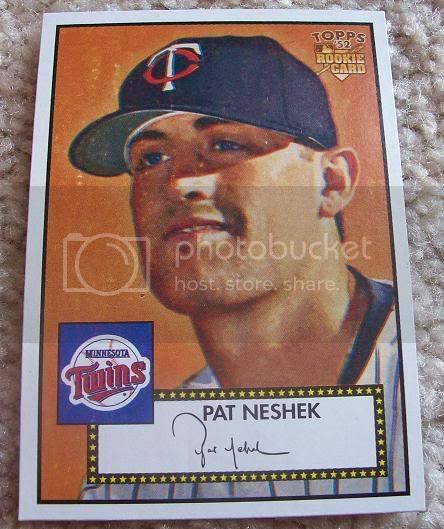 When I see this card I cringe because there is a lot of gloss on every card and they are very tough to sign...not to mention the image isn't the best card to sign on. This isn't one of my favorite cards. Same card as my the regular but this time the name on the front of the card is in gold rather than the normal silver. There is nothing different on the back of the card. Only 2008 of these made. The card is in all gold on the front and on the back it is #'d with it's rare print run. Just like the Gold card but this one is produced a lot less...only 58 of these are out there. Back of the Black card. Only one of these exist and I'm not sure if I will ever see this thing in my lifetime. If anyone knows the owner of this card I would love to make a trade for it. 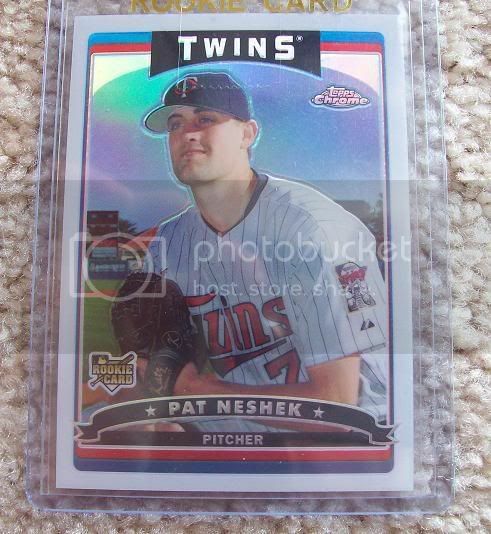 Only 1 of these exist...not sure I will ever see this card in my lifetime. I bet it's still sitting in a warehouse since the demand of this product was pretty bad. See notes from the CYAN plate...1of1 that will probably never be found. Only 1 of these exist and I'm sure I will never see this card! Only one of these exist and I'm sure it's still sitting in a pack of cards at this moment! I thought it was pretty neat that topps included me in this set. It's one of my favorite sets of all-time. The unique thing about this card is that it is a short print meaning they produced my card a lot less than most cards in the set. They do this to make set collecting a lot tougher. 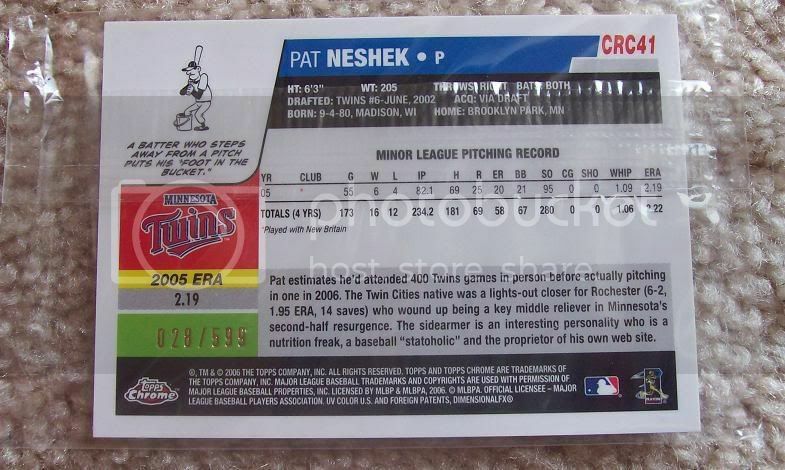 By being a short-print this card will always have value. I didn't expect to get another card in the A&G set but I was also included in the 50 state subset! 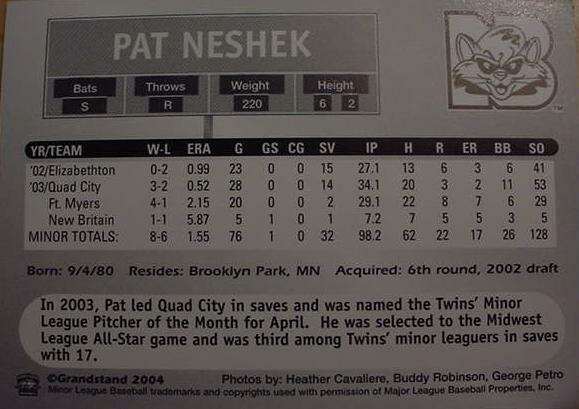 Topps took a guy born from each state in the US and gave them a card...I was lucky enough to represent the great state of Wisconsin since I was born there. If you send me this card TTM I usually sign it up and insribed it with 9/4/80, DOB, Madison, WI...One of my favorite cards for sure. Also included in the set was a unique subset of mini cards. They took each guy from the regular set and made a mini set. There are many variations of mini cards but this one here is my mini Base Card. Usually if you open a pack of A&G you get one mini card per pack, you get the idea that these are a lot tougher to find just by the odds! Same as my regular mini card but with a black border around the entire card...these black cards are found at the rate of 1 in four pack...only six per box and when you have 350 different black cards you start to realize how rare these cards are. I don't know what to call this card but it is an image of an boy from the 1900's...these are found at the rate of 1 of 2 packs you open...Just a tad more rare than the regular mini card. 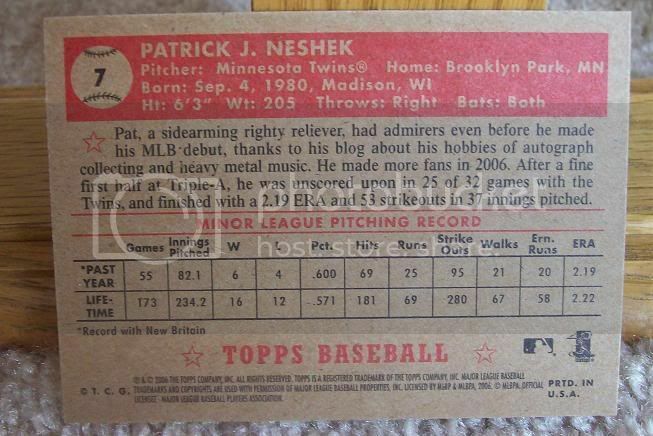 Same card as my mini but on the backside there is a bazooka logo that contains a hand written #. 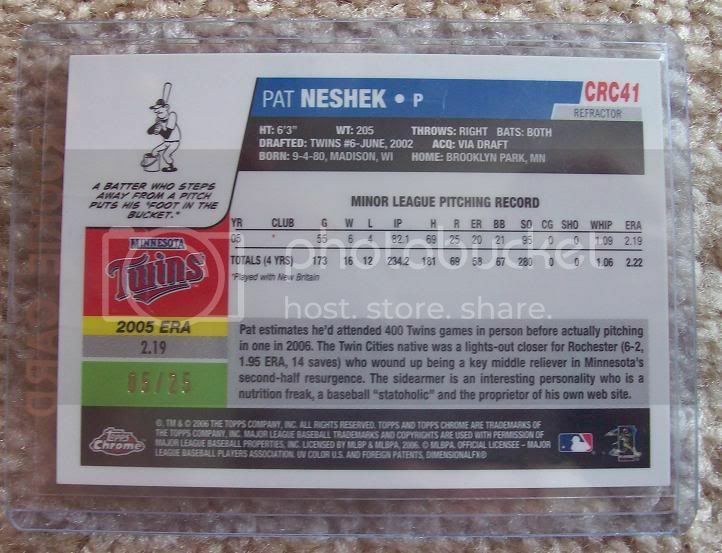 Only 25 of these were produced and they come at the rate of 1 per CASE...or 1 in 12 boxes of cards...extremely rare. Basically my mini card in a framed case...the card though is made of silk and is hand numbered to 10, very rare. I just picked this card up in a trade, very lucky...only one of these exist. It looks to me like the card is not made of wood and is an image of wood printing with the image of my card. Either way it's a very rare card and the only one produced. 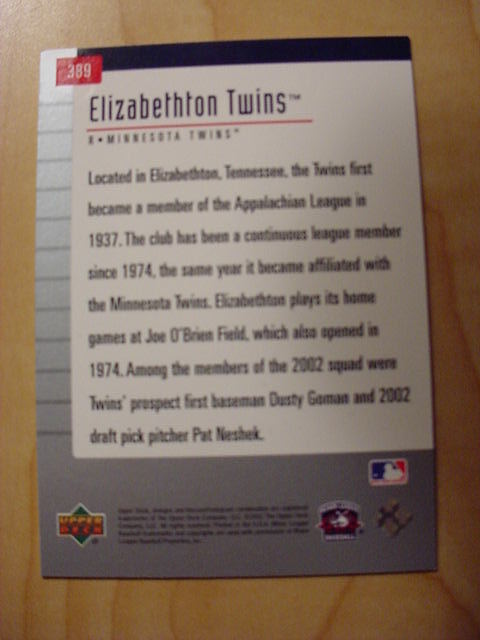 Was issued with other Twins players as a Twins set and usually sold at the stadium. The card is different in that my image is a little bigger and the number on the back of the card says MIN with the number. 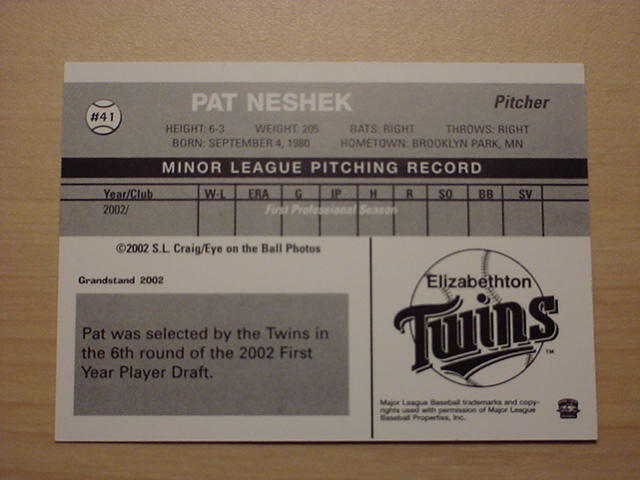 Same card as my 2008 Topps Series 2 card, the only difference is that this card was issued in the factory set. 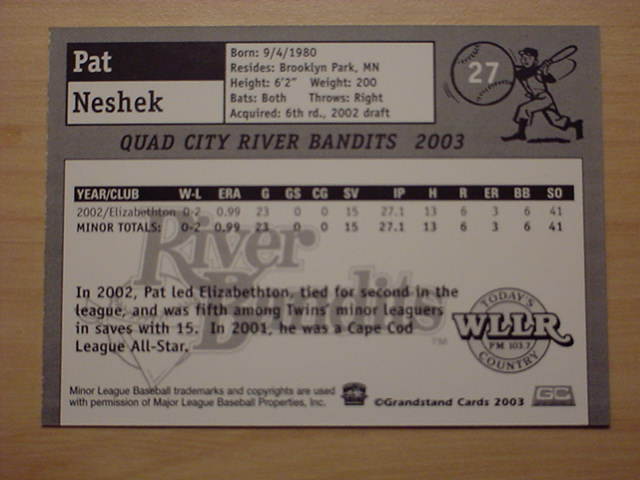 Issued by the New Britain Rock Cats as a set during the 2008 season. 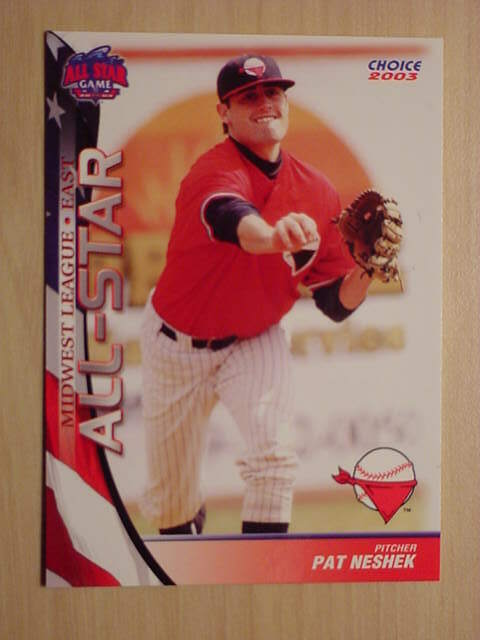 Fans voted on their favorite all-time players that played for the Rock Cats and the winners were put into a card set. This is the same image as my 2005 New Britain card but it is in black and white. 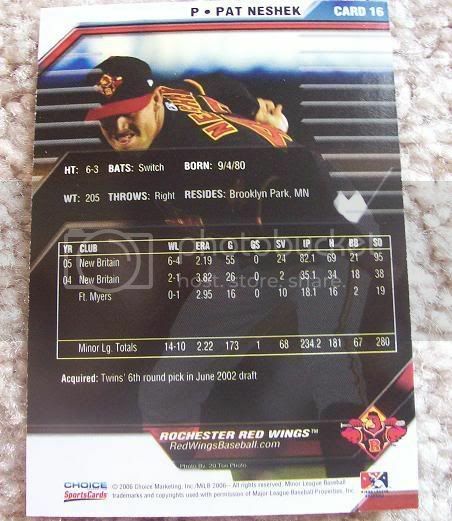 My big Upper Deck card of 2008...pretty frustrating card...not the best image, not the best set...not a fun year for UD and I! 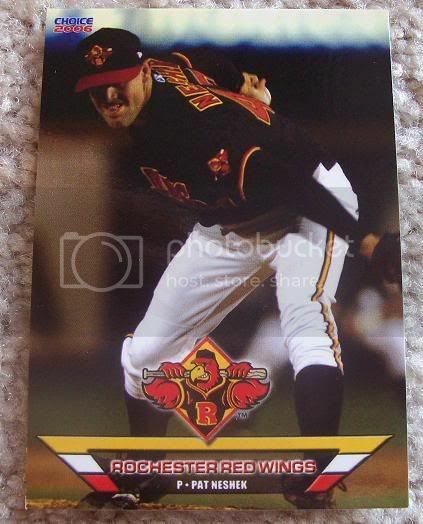 Same image as my 2008 Upper Deck card but a different set name is slapped on. They call this one UD 1st Edition...basically a very cheap card without the gloss.